← First World War: Myth or Misbegotten Shambles? 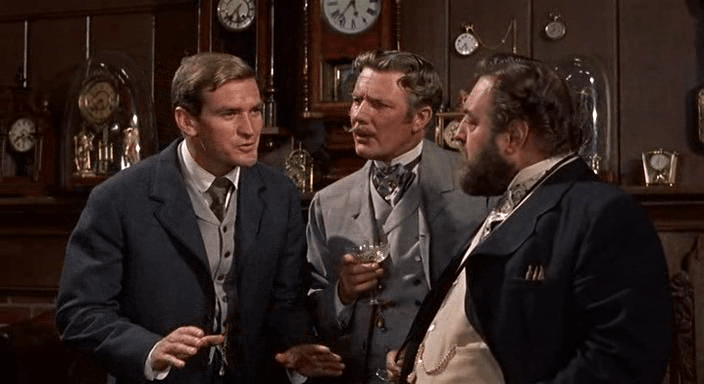 It is early January in a new century and a group of technicolored-Victorian gentlemen are awaiting the return of their friend from the future. I’ve always loved the 1960 film of HG Wells’ The Time Machine. Drawing inspiration from the two headed Roman God Janus, that gives this month its name, the film, like the book, looks backwards and forwards with a game of subjunctive history. Asking What if… questions about alternative futures. What if there were an atomic war in 1966 as the film, made at the height of the Cold War, imagined? Applied to your own life what might you find if you explored in fantasy the path you didn’t take? My inspiration for this year is one of HG Wells’ best friends, Arnold Bennett – just as much a man who looked to the future. He’d been born a pawnbroker’s son with a terrible stammer in the Staffordshire pottery town of Hanley at its grim sooty Victorian economic best and humanitarian worst. He started out as a rent collector and clerk, but escaped to Belle Epoque London and Paris and the world of journalism and art. He became a global celebrity, a bon vivant with Escoffier creating an eponymous omelette for him, still on the menu at the Savoy Hotel and a blockbuster screen writer of the great silent film Piccadilly. The most successful novelist of his era he often explored subjunctive history in his best novels. Imagine two sisters. The bold one elopes and the dull one stays at home. They meet again in old age. That’s The Old Wives’ Tale. What would it be like to escape fame and live an ordinary life instead? In Buried Alive a famous artist fakes his death and does just that. What if Bennett had never got away and, as in Clayhanger, and Anna of the Five Towns, stayed under the burden of his bullying father’s demands? Or, as in The Card, proved a confident charmer who stayed but exploited the hypocrisy and snobbery of his small town world to rise to be Mayor? Bennett even gave The Card, Denry Machin his own birthdate. 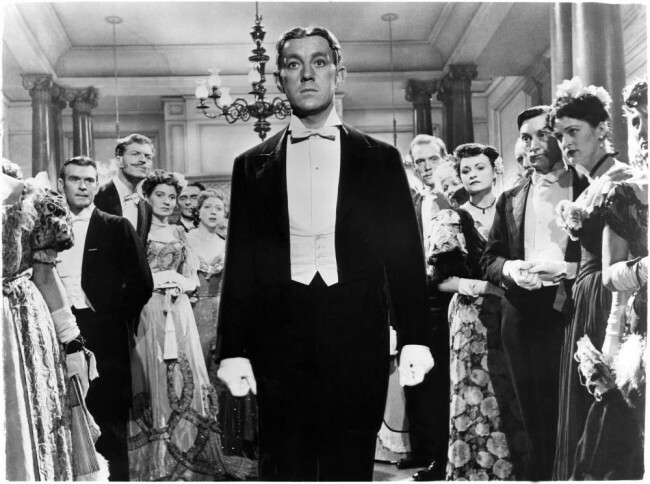 The story was memorably filmed with Alec Guinness in 1952 and it is a fantasy as delightful in its own way as The Time Machine. 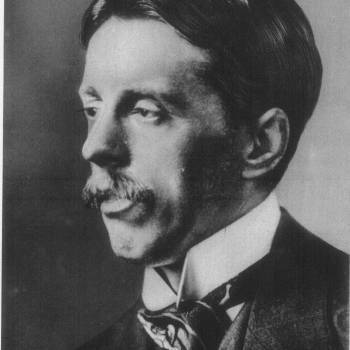 Arnold Bennett’s prodigious hard work (he wrote up to half a million words a year) meant he could afford to dress like a dandy; he bought a yacht and loved luxury hotels. But he admired and empathized with the people who worked in them, right down to the waiters and chambermaids, and how they organized their tips. Bennett’s biographer, the novelist Margaret Drabble, told me recently how London’s rich artistic elite such as Virginia Woolf, sneered at his stammer and what they called his “Cockney” accent (he was from Stoke-on-Trent, remember) and in doing so, Drabble pointed out, revealed not his vulgarity, but their own. Crucially Bennett never forget where he came from. He was constantly looking back. Like Janus, Bennett looked both ways all his life. What if I had never escaped? What about those who haven’t had the chance? Who benefits from this exploitation? Bennett was frustrated with politics. But he was optimistic; an futuristic man in a Victorian gentleman’s body, who delighted in how cinema and even the vacuum cleaner might liberate from drudgery and enrich ordinary people’s lives. And he was generous; sharing his knowledge with his self-help books, some still in print today, such as How To Live On 24 Hours a Day and How To Become An Author. Most of all, Bennett had a sharp eye for hypocrisy. He would have loved the story of Cooperative Bank chief and so-called Crystal Methodist the Reverend Paul Flowers. And the hypocrisy of independently wealthy MPs declaring they don’t need a pay-rise, which might stop them claiming much larger expenses from the taxpayer. Perhaps the best advice we could take for the year ahead, is to follow Bennett and keep looking both ways, connecting not just our own past and future, but asking where those in charge have come from and where they are taking us? My documentary Arnold of the Five Towns produced by Alice Bloch, airs on BBC Radio 4 later this year. This column first appeared in The Big Issue magazine. This entry was posted in Culture, Film, History, Politics, Science Fiction/Fantasy, Uncategorized and tagged Alec Guinness, Arnold Bennett, cinema, Edwardian, elitism, FTW, HG Wells, journalism, literature, London, Paul Flowers, Stoke-on-Trent, The Card, The Time Machine. Bookmark the permalink. Reading Bennett’s reviews in The Evening Standard, I’m struck by the breadth of his tastes and his enthusiasm for coming across new writers. He put both Wyndham Lewis and Virginia Woolf into his reading guide, Literary Taste: How To Form It. This generosity puts into an even worse light their snide, cruel remarks about his background, success and tastes. If I could build a time machine I would gladly spend a night in his company: good wine, good food and good chat.